The director Victor Levin ('5 to 7') is the man in charge of the direction and the writing of the script in this romantic comedy in the adult stage entitled 'Destination Wedding'. This romantic comedy reunites Keanu Reeves ('Matrix, 'John Wick') and Winona Ryder ('Girl, Interrumpted'; 'Stranger Things'). They see each other again in a movie, 26 years after their remembered apparitions in the mythical terror movie 'Bram Stoker's Dracula', by the great filmmaker Francis Ford Coppola, in which they were already a couple. 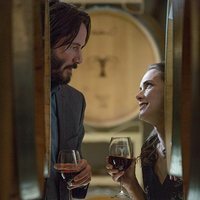 'Destination Wedding' tells the story of two miserable and unpleasant wedding guests, Lindsay (Winona Ryder) and Frank (Keanu Reeves), who develop a mutual affection despite themselves. Write your own 'Destination Wedding' review. Winona Ryder and Keanu Reeves have explained that the filmmaking of this comedy had "too much fan". A complete different situation compared to what they lived in '[BRAM STOKER'S DRACULA]'. Victor Levin is also the director of '[5 TO 7]', romantic comedy that received very positives reviews in 2014. The movie has received an 'R' rating in the United States due to language throughout and sexual content.